We were ar Mukteshwar, right on top of the hill, from the window where we stayed, we could see the 5 peaks of the Himalayan range. It was beautiful. Suddenly same roaring sounds like the turbulent sea crashing against the rocks, the familiar sound of the Arabian sea. My husbands Guru then told me something very interesting. “yeh awaaz, vaayu aur van ki garshan hai,or jo tum sunke badi huyi ho, woh saagar or vaayu ke garshan tha, aur chataan use saha raha tha.” I might have got the gender wrong, this is gist of what was said. He then went on to share that wind, breeze or cyclone, hurricane they are all natures breath. Probably the easiest way to connect with the basic force of nature is focusing on the essential element of air during meditation. This is from a personal experience. The best way to do it is by centring ourselves on our breathe. We inhale the life-giving force, feeling it fill us, and then release to it into the world to let our breathe mingle with the breathe of nature. One afternoon, I was working out on our terrace, the rustle of the leaves was comforting,. Gradually as I focused on the rustle of the leaves I could experience the gentle breeze and the chirping on birds. The chirping of the birds picked an octave very rhythmically with the rustling leaves, as I became aware of this I also became aware of the fact that this was in synchrony with my own heart beat. When I could let myself accept being part of this cycle there was this moment of being formless and part of the infinite. This has been my support system since. If I cannot feel the wind then I recall times when the wind god sent me gifts to caress my bare skin, ruffle my clothes and tousled my hair. The sounds carried by the wind, the peel of laughter, a son, or the winds own duet or dual with the trees, as its mood may be. The currents gently lifting the birds to greater height. The unfurling flags, the banners that beckon, the wafting scents from the exotic oceans or the roasting onions next door, the sharp essence of flowers, the musty smell of decay all these carry us gently to the lap of nature. These memories enliven our senses, and let us experience the vital force that surrounds and animates us we can look to the trees to sway in time with nature’s rhythm. Just as we can be soothed by the winds, we know that nature has great power. When I see the sails, or flying balloons, it feels, like the wind God is indulging us, by carrying us where we want. Even as we speak it is the wind in its many form that carries our words to its destination. 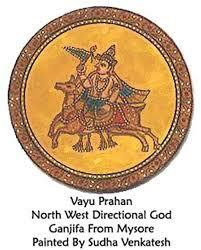 Yet we have forgotten to honour this Vedic God. May be it the Madhwa upbringing we were always told Vayu Jeevotham, Hari sarvothama. Previous PostPrevious A message from pain. Next PostNext Truths the Media does not share.